Like so many antiques, they find their way from house to house or family to family. So many of our treasures have been passed down through family members. This is my favorite as I am so sentimental! I love pieces with a story and memories. This week’s antique of the week is a beautiful mantle at my brother’s house. 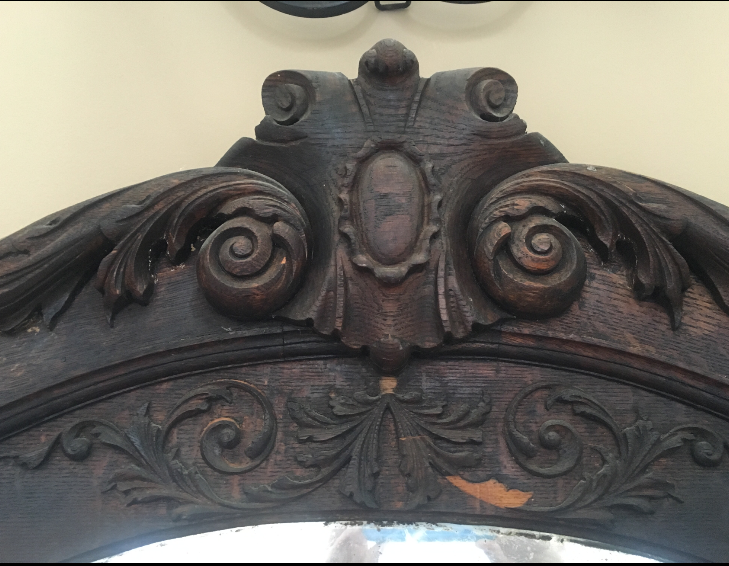 It originally came from Bristol, Tennessee and was in a gorgeous turn of the century Victorian home that my Aunt and Uncle restored. It had a beautiful front porch and a fireplace in every room! They needed to upgrade some of the rooms to better utilize the space so unfortunately in one of the rooms, there was no space or need for a fireplace. So sadly, out came the mantle. My Grandfather, who helped with some of the painting and projects put the mantle on his trailer and hauled it home. It stayed in his garage for years and years. Finally, he gave it to my parents, who were remodeling their lake house. (Little by Little is the name of my parent’s lake house-you can read about their Courtyard Refresh on the blog) Unable to fit a fireplace into their plans, they subsequently passed it along to my brother. The mirror has a unique curved shape and is beveled. It has lost some of its silver but looks perfect in its vintage condition. The columns on each side are intricately carved and the detail is so pretty. This is definitely the show piece of their family room. With their new open floor plan, you can see the fireplace and mantle from all angles of the entryway and most of the kitchen. The top of the mantle has a beautiful carved detail that you just don’t find anymore. The mantle is still in its original state and the rich color and patina is evident. There are a few minor pieces missing here and there but that only adds to its charm and elegance. Obviously my brother and his family love it too! I’m so glad this piece stayed in the family and will surely be passed down to their children one day and will have a new life in a different home!